4. Make a bow. Use slightly bendable wood for the bow. You’ll be putting a lot of pressure on the bow and dead wood is more likely to break than similarly sized green wood. Beginners should make a bow 1.5 to 2 feet long. 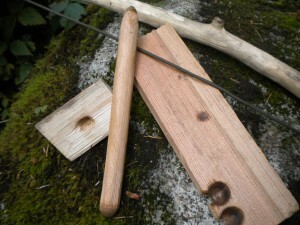 Use as thin a piece of wood as you can so the bow will be as light as possible. A lighter bow is easier to control and takes less strength to push back and forth. However, it has to be stiff enough to not bend when you’re using it. Use a shoelace, drawstring, small rope or whatever cordage you can find. Leave a little slack in the cord so that you can twist the drill into the bow. Once the drill is in the bow, the tension should be nice and firm. 5. Make a fireboard. The fireboard and the drill both need to be made from light, dry, non-resinous wood. The best wood for this won’t have any sap and will be light and soft enough to easily dent with your thumbnail without gouging. Shape whatever wood you choose into a piece about an inch thick, 2-3 inches across and at least 12 inches long. 6. Make a drill. Your drill should be made of harder wood than your fireboard. Remember that you want the fireboard to hold the coal and not the spindle! Try to find the straightest piece of wood possible. Your drill should range between about 1 – 1.5 inches thick. Start with a stick about as thick as your thumb or index finger. It should be at least eight inches long and as straight as possible. 7. Find or make a socket. Your socket can be made of bone, wood or rock. Look for a rock with a smooth dimple in it. Ideally, the rock should be about fist sized. It should fit easily in your hand but not be too small or it can heat up very quickly. The ideal rock has a deep dimple with smooth sides. If you can’t find a rock, the easiest socket to make is wood. This entry was posted in Advice and tagged fire, Stick Fire by matt. Bookmark the permalink.